These spots have a large table or two, or are large enough that they can accommodate groups of six-to-ten with advance notice. The Green Goose – This stand-out Irish pub with craft beer & good grub is spacious enough to accommodate groups. Jeanne A – The canal adjacent rotisserie/épicerie/restaurant has large tables that can be booked for groups of 10 with menus that start at 30€ per person. We’ve always found them to be quite accommodating for vegetarians, too. Le Perchoir – The airy perch is a great place to drink with a view, but it’s understandably popular and a large group runs the risk of a lengthy wait in line. Cut the line by booking at the restaurant and head upstairs after for the stellar vista. These restaurants have private rooms or floors. Reservations essential. Au Boeuf Couronné – This steakhouse that specializes in all things meat & potatoes has a private room on the upper floor that can be rented out for private parties of up to 40 guests. La Ferme Saint Simon – You can Goldilocks your way through three separate private rooms until you find the one that’s just right for you: the Champagne Room for 14, the Burgundy Room for 10, or the Bordeaux Room for 8. Each room has a flatscreen TV and free wifi in case you can’t stand your dining companions. Verjus – This beautiful restaurant near the Palais Royal has a private room that feels a bit like a cozy living room on the 3rd floor and can fit up to 12 people for a modern French tasting menu. Les Papilles – You’re committing to a no-choice menu here so don’t invite any fussy friends, but there’s an entire downstairs room that can seat a large party. Le Mary Celeste – One of our absolute favorite cocktail bars has basement seating, steps away from the kitchen, where you can enjoy beef tongue grilled cheese or gingery Asian deviled eggs with up to 14 of your friends. Le Bon Georges – The upper part of this excellent neo-bistro in the 9th can be privatized for parties of up to 45. 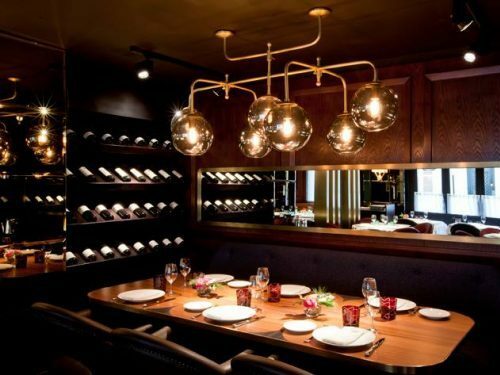 Astier – The private room can seat forty, the cheese plate could feed an army. Jeanne B – The charming épicerie/restaurant on the slopes of Montmartre has a large table in the front window that can comfortably seat 8-10 if booked in advance and a hidden room behind the deli that can be rented for a party of 20 or so. Boucherie Les Provinces – Eat meat directly inside the butcher shop with 12-18 of your closest friends on Tuesday, Wednesday or Saturday evenings by special booking. Pottoka – There’s a single 16 person table in the annex attached to Pottoka, and it can be all yours for the evening. There’s even a retractable TV for those who want Basque food for special sporting events. Garance – Book the private room for up to 14 at this modern bistro near Invalides. Mini Palais – Mini Palais isn’t very mini at all. It’s a very large, centrally located restaurant with a beautiful terrace, that can accommodate large tables or massive private events. Ô Chateau – The enormous wine bar near Les Halles has 3 separate rooms that can be privatized: La Vinothèque (2-12 people), Le Salon (2-30 people), La Cave Voûtée (2-60 people). Ô Chateau doesn’t charge by the room, but each room has a standard food/drink/foie gras minimum charge. Video screens and Bose sound system available, too. Taillevent – There are two luxurious private dining rooms available for groups of 6-12 or 10-36 at this old-fashioned spot. Expect to shell out the big bucks. A Noste – The sprawling Basque restaurant with a food truck inside can be privatized in its entirety or by floor. Do you have any favorite spots for a crowd? Feel free to share with us in the comments below.